Salamanders should be kept only with their own species. While reading information online, keep in mind that newts are also considered salamanders. Salamander enthusiasts are a great source of information on your new pet. Forum links are listed in the references below. According to Nature Haven, there are approximately 350 known species of salamanders in North America. 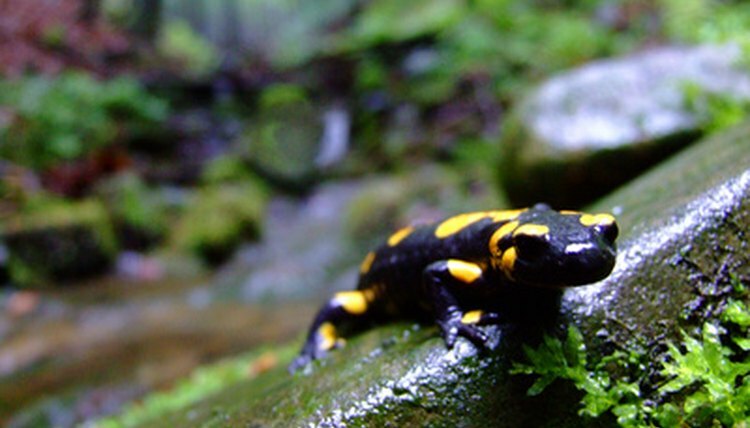 Salamanders, whose scientific order is Caudata, have nine different families of species. They have soft, moist skin and are found near shallow bodies of water. Salamanders are generally shy amphibians, though some species including the tiger salamander, are said to recognize their feeder and even beg for food. Identify the species of wild salamander that you have. In order to properly care for your pet; it will be important to first determine any special needs it may have beyond basic salamander care. For example, some species of salamander are aquatic and live their entire lives in water. Their natural habitat will need to be determined so that you can create a suitable tank. In the reference list below, you will find a link for identifying salamander species in North America. Create a habitat for your wild pet salamander. Salamanders should be kept in a glass tank that allows them space to swim, climb, and hide on land as well. This can be accomplished by filling the bottom with gravel or sand and using the bottom material to create an island. Use soft, damp material for the land areas in the habitat. Examples include soil, damp shagnum moss, damp bark or unbleached paper towels. Water provided needs to be chlorine free and changed regularly or filtered through aquarium filter. The habitat should be covered with a screen, hood, or cover that includes holes for air. The habitat should be kept at 55 to 78 degrees Fahrenheit at all times. This can be achieved by using a reptile light placed over the land area of the habitat. Place a thermometer in the tank to ensure proper temperature is maintained. Feed salamanders insects (crickets, brine shrimp, bloodworms, night crawlers, or mealworms) by hand or with the use of tweezers. Salamanders should be fed every one to three days and in the evening since they are nocturnal. Offer your wild pet salamander a variety of insects to simulate their natural habitat. Insects can also be dusted with calcium supplement once a week for additional nutrition.